Cheyenne to Flaming Gorge NRA, Wyoming – September, 2015 Jim appeared mildly alarmed when I looked at him one afternoon and stated “I want to be more adventurous in our sleeping arrangements.” Relief registered on his face as I went on to explain I thought we should be more daring in choosing boondocks. We were about to make our way across Wyoming and I had my eye on a couple of free camping arrangements. The weather was perfect for boondocking and Jim was agreeable. Our first destination was Cheyenne. We expected to get there around lunch and needed a place to leave the trailer while we explored the town, then we planned to move on first thing the next morning. I saw Sierra Trading Post listed under overnight camping on my Allstays app. It looked great and a heck of a lot better than a Walmart. When we arrived we discovered it had a huge empty lot for RVs. The employees were also incredibly friendly and the store was pretty great too. They sell sporting goods and apparently do a huge amount of business online. The further you went into the store the bigger the discounts got. I wanted to check out Cheyenne’s free botanical gardens. What we found was a lovely park that included walking trails, a lake, and the gardens. A big part of the gardens were closed for construction but what was left was very nice. My favorite part was the children’s garden. It was beautiful and extremely well planned and appealed to the child in each of us. We returned to our home in the parking lot. We were joined by a motor home and a semi later that evening. It did turn out to be one of the louder places we have slept. Semi-trucks carrying goods to and from Sierra’s warehouse drove right by our rig all night long. But this minor inconvenience was worth the savings. Our next stop was Flaming Gorge Reservoir. We aimed for a dispersed camping area on the west side of the lake called Buckboard South. I had reviewed the satellite image and thought it looked pretty safe. We actually did have some close calls on the road in and could have found a better route to our campsite if we had scouted it better, but it all worked out. We had a great spot right by the water with this view. Which got even better at sunset. We didn’t see another sole the whole first day. The next day we went for a walk and discovered a neighbor just a half mile from us. While kayaking we discovered there were about a dozen campers on the peninsula. The best campsights were at the very end but they also had the nearest neighbors. I liked our private site back in the cove. We finally got our replacement solar panels installed. 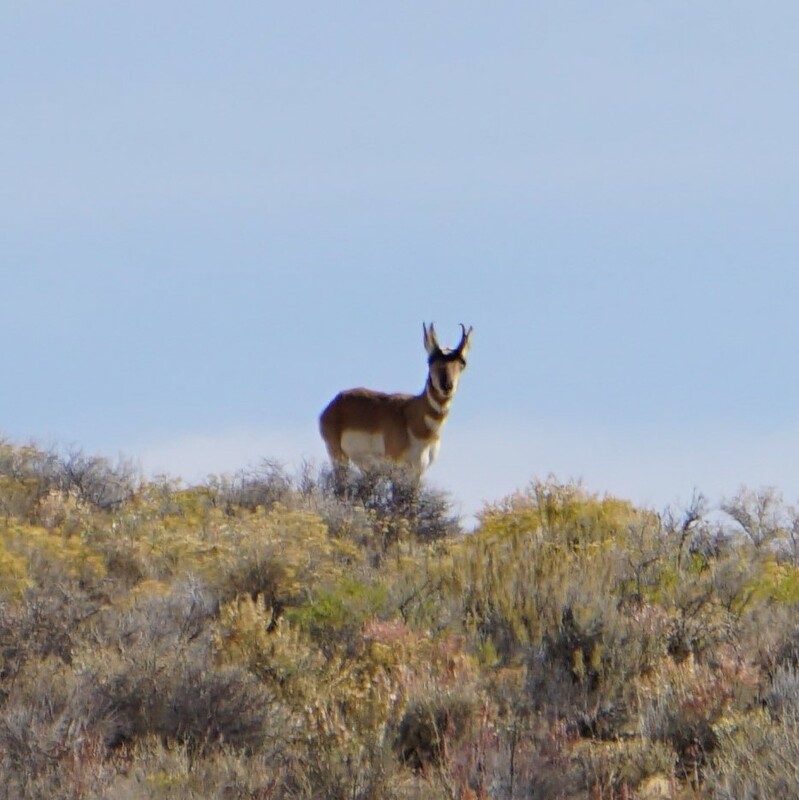 While working on the roof we discovered we had an audience, this pronghorn. We also saw about a million rabbits. 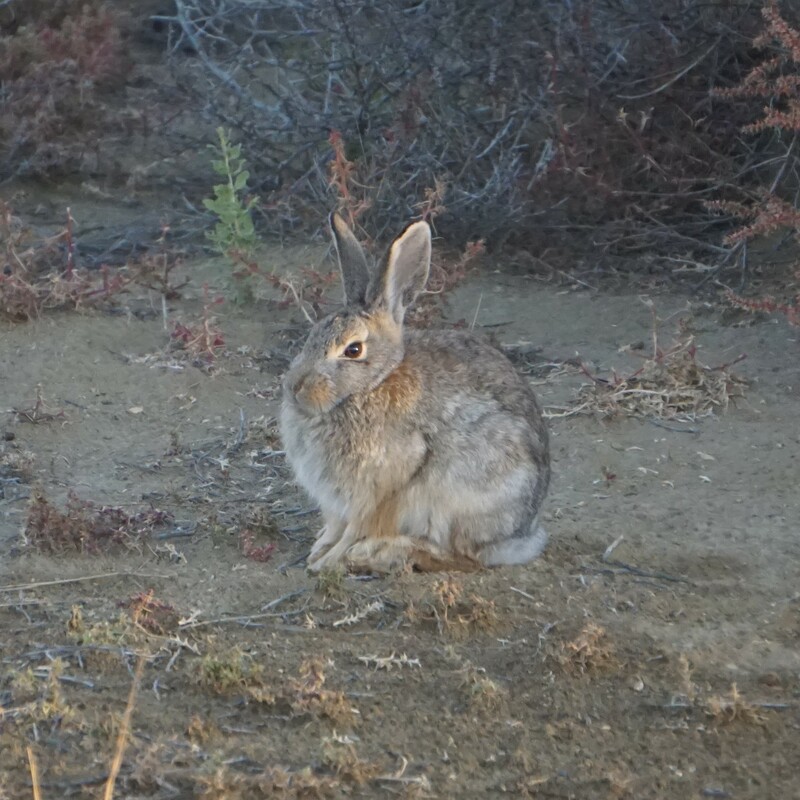 They looked like a cottontail but were as big as jackrabbits. But the best part about this boondock in the middle of nowhere was the night sky. I woke up at 2 am one morning and stepped outside. It was amazing! I had been dying to play with the settings on my new camera so I dragged it and a tripod outside for about an hour. Jim was sound asleep and every time a fish jumped behind me I just about had a heart attack. I have a lot to learn about night photography. I believe a bit of beginner’s luck was involved when I captured a shooting star directly over my rig. Not 20 minutes after I got back to my warm bed I heard a lot of scuffling noises outside. The next morning we discovered coyote tracks around camp and their hairs on our grill. Glad I didn’t run into them while I was out there! We just finished our first visit to Flaming Gorge area a few weeks ago! We stayed on the western side, as well, but in the Recreation Park outside Manila and got a grand site right by the Green River. Sure is a gorgeous area. My home state…although I live in the northern part (Sheridan). There’s something magical about this place…if you can get over the wind and the long, bitter winters!